This once dark basement is transformed into a sleek and luxurious space perfect for entertaining. With a "U" shaped configuration, bulkhead, and a support beam that could not be removed, the focus was on maximizing function by creating four separate areas. A dining area; large seating area; dry bar and wet bar. With a walk-out patio sliding door to the back yard, this basement family room is a perfect spot for relaxation and fun. 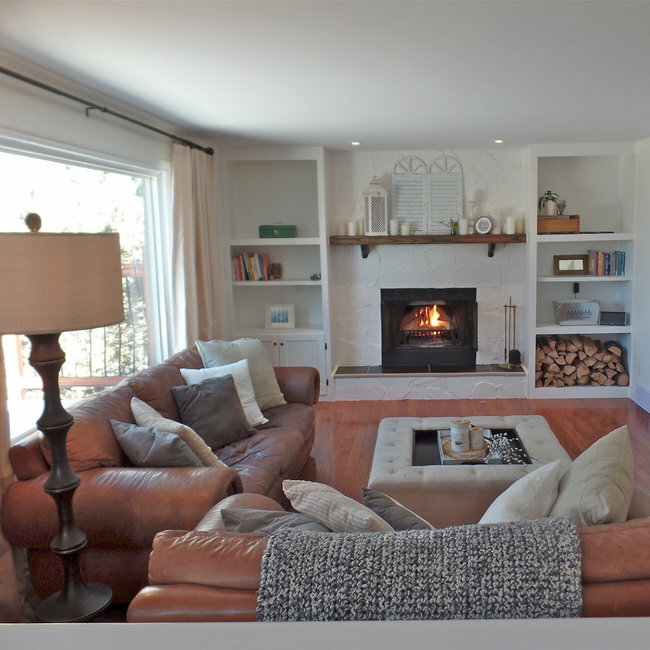 This family home was given a fresh look by overhauling the family room and stairwell, while the kitchen, living room and dining room received a update. A fresh coat of paint, new backsplash tiles and lighting in the kitchen, and new crisp white trim lightened up the whole main floor. Custom furniture in neutral tones were brought in and given pops of colour through the accessories. The client's former dining room set was given a new lease on life with a painted hutch and buffet and dark stained table and chairs for a more formal look. A classic, yet simple chandelier completes the look. A former kitchen with a staggered sight line, tiled countertop, and brass trim gains a fresh perspective with minor updates. Keeping the original cupboards as is, new additional uppers with glass fronts appear to blend seamlessly with the old, adding drama to high ceilings. A new black Caesarstone countertop, Blanco sink, kitchen faucet, polished nickel hardware, and marble backsplash complete the transformation! This bright and cheerful kitchen has been transformed from a dark outdated space to an open family friendly zone. Vintage touches combined with warm rustic elements create a casual and comfortable spot for a young family. 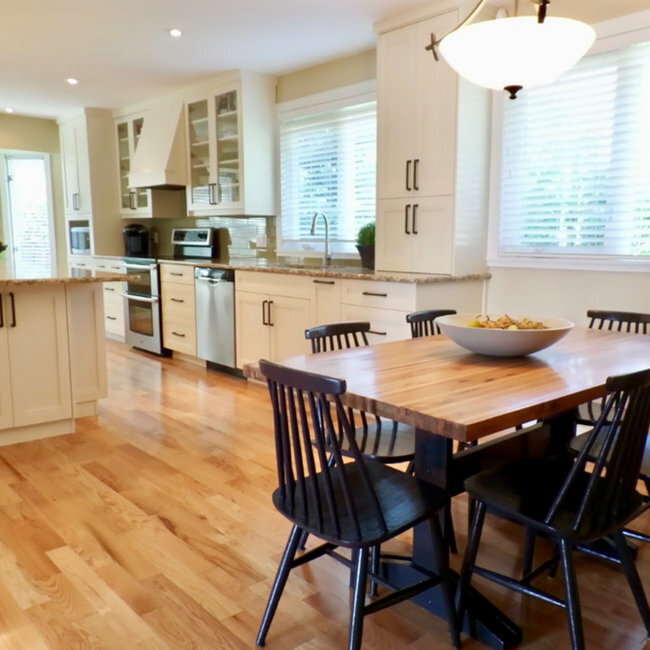 A dark and quirky kitchen has been transformed into a light filled space perfect for entertaining with the addition of a U-shaped counter and the removal of a wall that once separated the kitchen from the dining room. A wall unit housing a wall/ microwave combination and fridge maximizes storage space in a clean linear fashion. 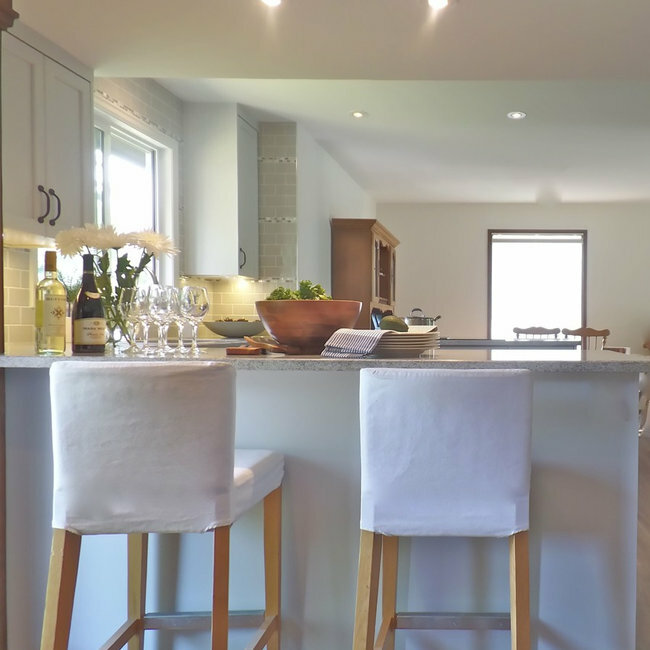 Custom cabinetry is used to great effect with the existing bulkheads and open shelving with countertop below provides a space for charging phones and a coffee maker. Water damage to a kitchen floor gave way to a complete overall of the kitchen and dining room. The clients love their huge family gatherings so on the wish list was a 10 foot island with plenty of storage space. The wall separating the kitchen and dining room were taken out and cabinetry runs the entire length of one wall. Tall cabinets flanking the fridge are built into the opposite wall for a more streamlined look. The kitchen table and chairs were built by the client, so we painted the table base and chairs a glossy black for an instant modern update. This Varsity kitchen gets a new lease on life and will be enjoyed for many years to come. Using the footprint of the original cramped en-suite, the tub was removed and replaced with a glass front shower to make the space appear larger. 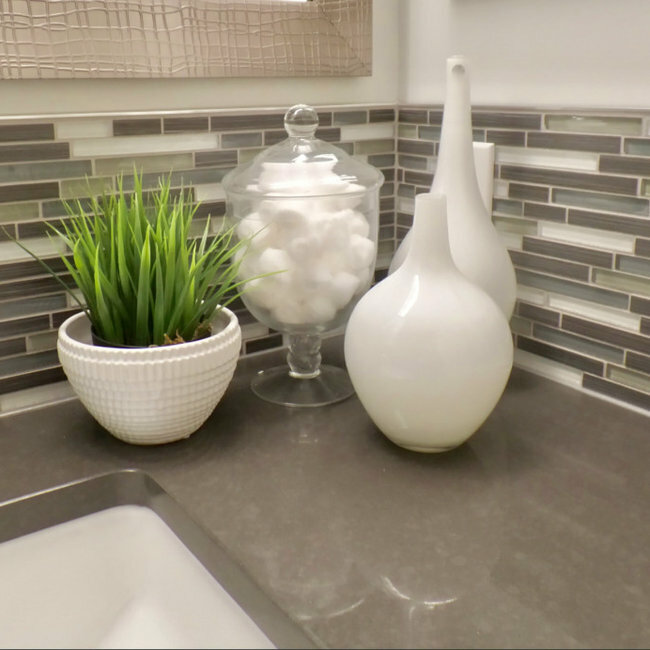 Placing the beautiful porcelain 12 x 24 tile vertically on the wall added visual height to the tiny space, while the horizontal flow of the back splash throughout created a widening effect. 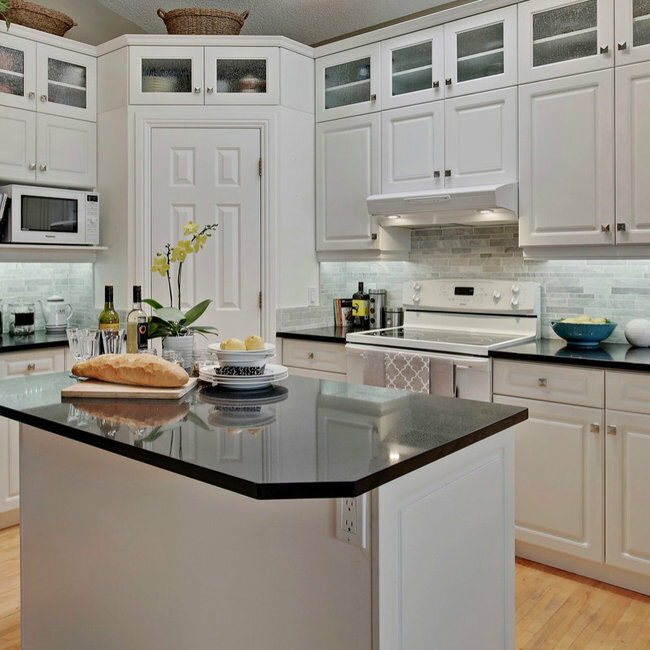 Tall cabinetry with clean white glass fronts add extra storage and height. 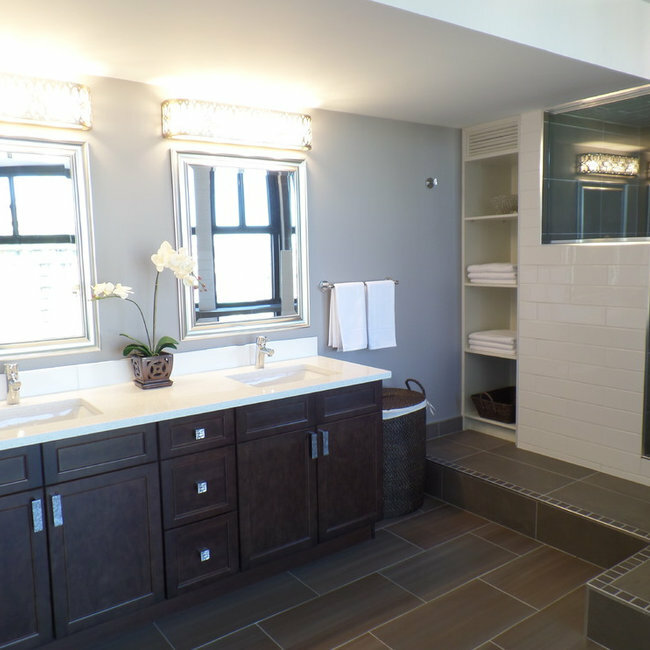 Though small in size, this Master Bath is filled to the brim with functional, modern, and glamourous touches. An outdated master bath with a tiled corner soaker tub was anything but relaxing. The homeowners described the space they envisioned to be calm and serene. Using a palette of soft greys, a timeless and elegant space was created for their enjoyment and relaxation! 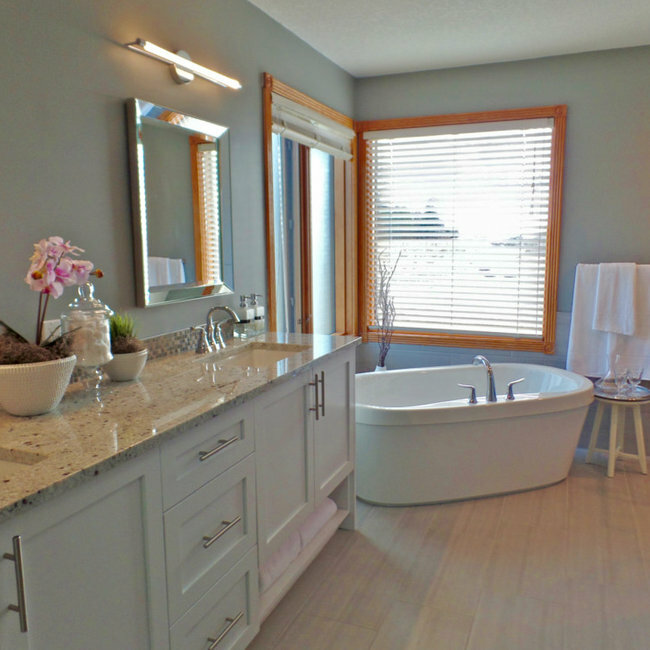 Custom cabinetry and a stand alone tub create the ultimate space to relax. A large glass shower door visually enlarges the ensuite and provides maximum functionality in this beautiful space. This basement bathroom was very dark and completely covered in 1 x 1 brown tile from floor to ceiling. 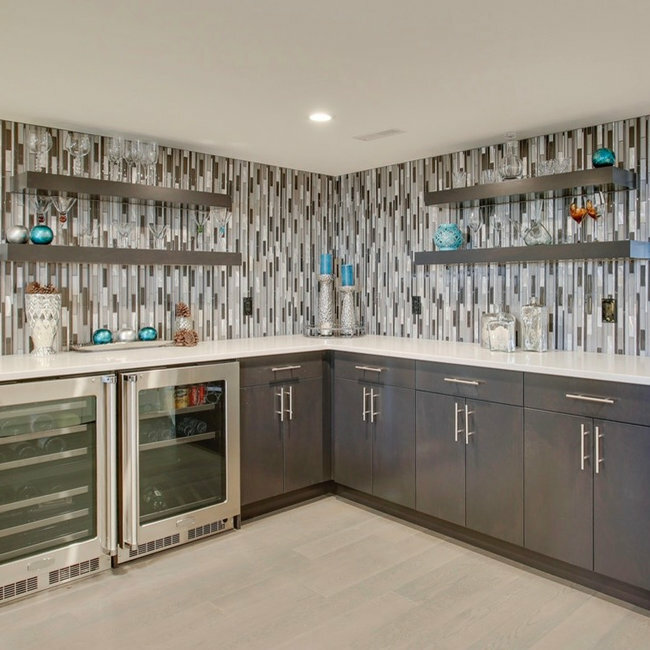 The space is freshened up with a combination of white glossy 4 x 16 tiles, strip mosaic, sophisticated dark cabinetry, sleek polished nickel hardware, contemporary chrome faucet, and white quartz countertop with a white under mount sink. The shower now features a clear glass partition with built in bench seating and niche to further open up the tiny space. Lighting and mirror from Feiss add a glamorous and sophisticated touch. This spacious penthouse condo was in need of a major update and a dash of personality! 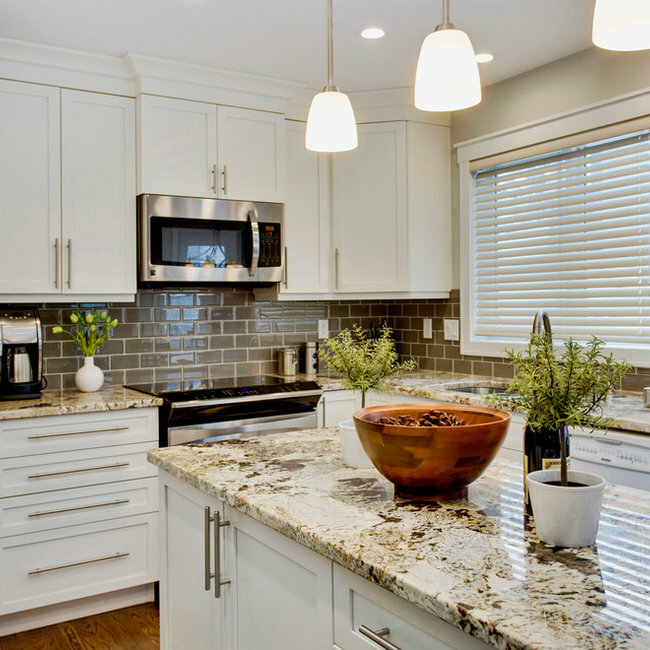 Colours are calm and soothing with grey undertones and dark stained cabinetry topped with white quartz countertops for an timeless classic look. What was once a oversized soaker tub, becomes a shower stall, soaker tub, and storage to maximize functionality in the Master Ensuite. Decorative metal tiles dress up the fireplace surround, while lighting with crystals add sparkle and a elegant ambiance to this space that is perfect for entertaining and enjoying the incredible view. 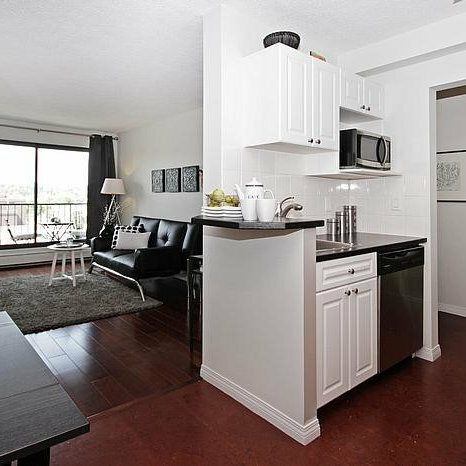 This one bedroom condo was staged, put on the market and sold in 4 days! Prior to get this older condo ready for sale, the previous owner had painted all the walls in strong dark colours. To brighten up the space, we used a very soft white paint with a hint of grey and painted cabinet doors and trim in Benjamin Moore (Oxford White). 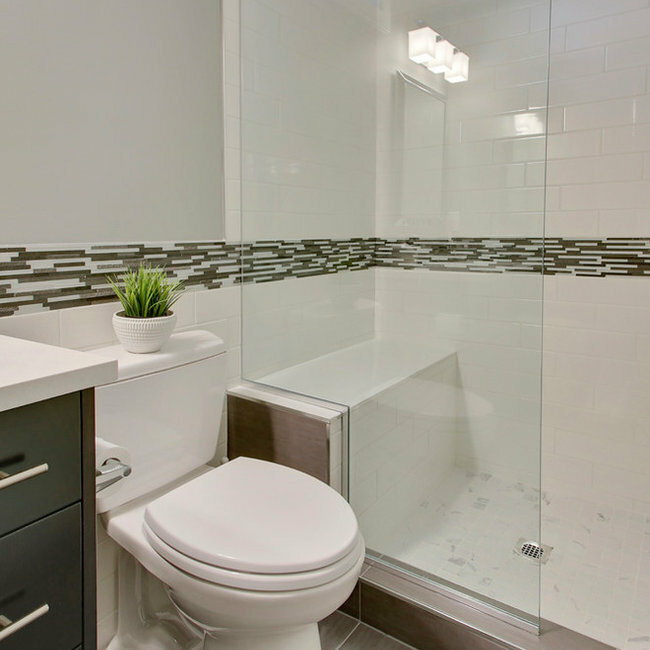 New flooring in the bathroom, updated hardware, new appliances, and of course furniture and accessories were key to making this condo appealing to the urban dweller in a great downtown location! 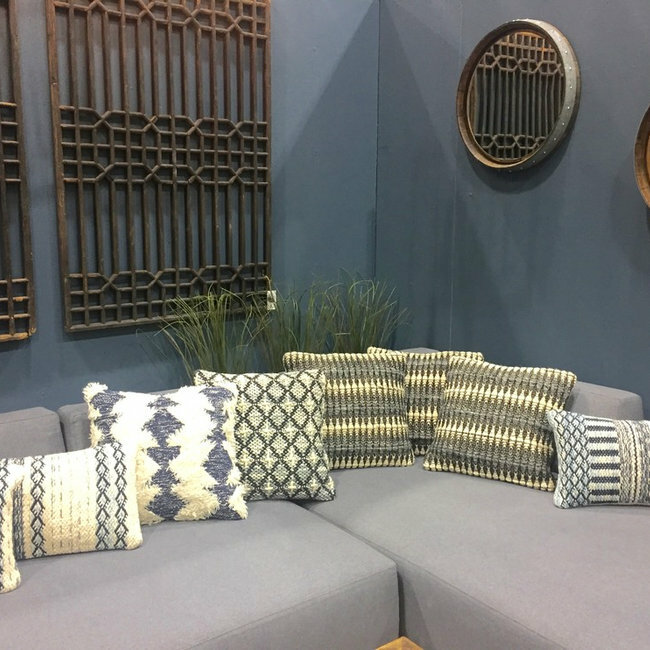 Various room settings at the Calgary Renovation Show 2017 "Ask a Renovator" feature a mix of antiques and salvaged decor with contemporary pieces. A boho beach inspired theme at the Ask a Renovator lounge, is a great example of this. Vinyl plank flooring named "Beach House" and "Deep Water" paint on the walls, further evoke a sense of serenity to this warm and inviting space.